Publisher: New York, Hearst’s international library co.
e there in the valley of Dilly-Dally From seven till after nine.It s here with the bees we do as we please, Said little Somcotlicrtime.While here we stay We play and play— What else is half so fine? And then they were off to the By-and-by tree,Where the big cockatooAnd the little cuckooWere calling away with noisy ado :We dine some time; some time we dine !But oh, we are hungry as we can be!Our little boys said: And who can seeA sign when dinner ready will be ? 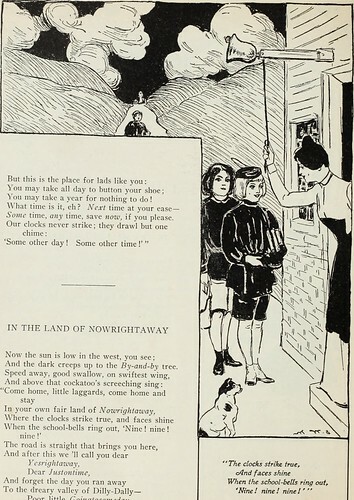 Then the cockatoo winked at the little cuckooSome time, some time we 11 wait on you.This, boys, is the land of Weregoingto;It s a long way off from Nowrightaziuy,Where even the cooks are on time, they say. 42 POEMS FOR CHILDREN OF ALL AGES But this is the place for lads like you:You may take all day to button your shoe;You may take a year for nothing to do!What time is it, eh ? Next time at your easeSome time, any time, save now, if you pleaseOur clocks never strike; they drawl but one chime:Some other day ! Some other time !